Yes! You read it right. There will be no classes in Manila on January 9, 2015, Friday, the Feast of the Black Nazarene. In Executive Order No. 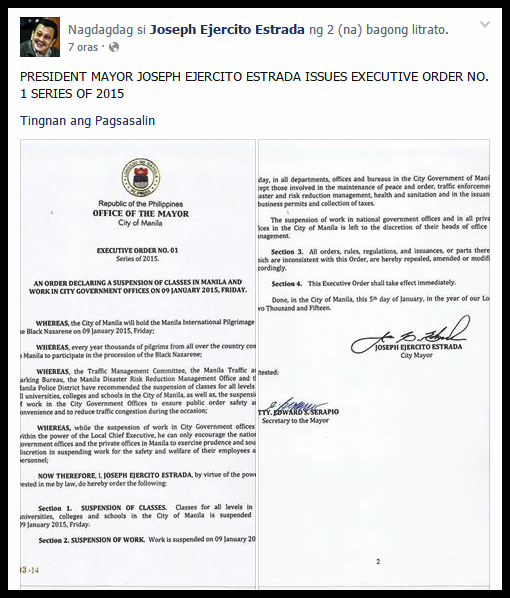 1 for 2015, Mayor Estrada said the suspension will cover public and private schools at all levels. "Classes for all levels in universities, colleges and schools in the City of Manila (are) suspended 09 January 2015, Friday," Estrada said in his order, which was posted on his Facebook account. Devotees of the Black Nazarene are expected to flock to Quiapo this week for the yearly feast of their patron, whose image is believed to have miraculous powers. issuance of business permits and collection of taxes. But Estrada said the suspension of work in national government offices and private offices in the city "is left to the discretion of their heads of office."